Upon arriving at Delhi airport, meet our representative who will assist you to transfer to the hotel for an overnight stay. 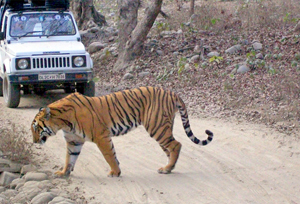 Today, we will leave for Corbett National Park early in the morning. On arrival at the Park latest by afternoon, we shall check in to the resort. After the lunch, we will take you on a guided nature walk and to the famous Garjia temple. Overnight stay at the resort. Early in the morning after the breakfast, we shall take a jeep safari to Dhikala Forest Lodge. 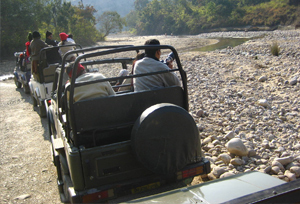 On the way, we are likely to spot many wild animals. After check-in at the forest lodge, we will be having lunch. Later, we shall take the evening safari to Chaud, where we can spot elephant, wild boar and if lucky tigers. Return to the lodge in the evening. Tea and snacks will be. Dinner and overnight stay at DFL. Early in the morning we will take a jeep safari. After returning from the safari breakfast will be served. After the breakfast, we shall drive back to the resort in Corbett. Lunch will be served in the resort and evening will be left free to relax. Overnight stay at the resort. In the morning after the breakfast, we will drive to Binsar, enroute we will visit Binsar sanctuary. Binsar offers a good opportunity to the avid birders and photographers. Overnight stay at Binsar. Today we will drive to Munsiyari from Binsar. Munsiyari is a small village, from where one can get the spectacular views of Pancha chuli peaks and the Milam and Ralam valleys. 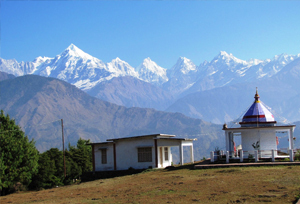 Munsiyari is also a base camp for many treks in Uttarakhand. Overnight stay at the hotel. We shall be visiting to Khaliya Top today, which is situated approximate 11 Km from the Wayfarer's Resort, at a height of 11500 ft. From this hillstop, one get witness the spectacular view of the the Pancha chuli peaks. The trek to Khaliya Top through dense forest and an overnight stay in alpine tents is a must. Today, we will try our luck at angling. There is an immense scope of trout fish and Mahasheer in Ramganga and Gori Ganga rivers within the radius of 40 Kms. Separate arrangements for a guide and packed lunch can be made. Guests are expected to bring along their own angling equipments. We will drive to Patal Bhubaneshwari (05 Hrs) and spend about 02 Hrs visiting this limestone caves, which depicts the legends of The Mahabharata, the great Indian epic. After exploring Patal Bhubaneshwar, we will head to Chaukori, which is a small Kumaoni Village that has tea gardens and the backdrop of the mighty Himlayas. The road to Chaukori is along the famous Berinag ridge. Overnight stay in a Tourist Rest House. In the morning, we will drive to Mukteshwar through narrow roads that are dotted with small villages. 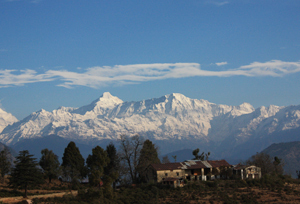 Mukteshwar and its nearby destinations are famous as the fruit bowl of the Kumaon. Apple, pear and peach orchards cover the hillsides here. Overnight stay at resort. We shall drive back to Delhi in the morning to reach by latest by the evening. Overnight stay at a hotel in Delhi. Transfer to airport as per your flight schedule.